You’ve heard the stories: Back in the day, your mother used to nurse you, burp you and then set you down on the car floor, all while hurtling 60 miles per hour down the freeway. How times have changed. Washington State parents now live under one of the strictest child car seat laws in the nation. And with all the options out there, choosing a car seat can be daunting. Know a few basics, and you’ll be safely on the road in no time. There are three types of child car seats: infant seats, convertible seats and forward-facing seats. All car seats must be used in the backseat of the vehicle — never in the front — and in the center if possible. 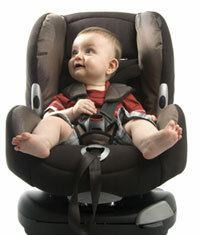 For all types of car seats, babies must be within manufacturer weight and height parameters. Infant car seats are rear-facing and generally fit babies weighing 5 to 22 pounds. Although they can only be used for a short time before the baby gets too big, infant car seats are popular because they cradle the baby well and can be snapped in and out of a base that stays in the car, so you don’t have to reinstall the car seat every time. Convertible car seats can be used rear-facing for infants and then turned around to be used forward-facing once the baby is at least 1 year old and weighs at least 20 pounds (although the American Academy of Pediatrics recommends keeping children facing the rear until they meet the maximum weight and height allowed by the car seat for rear-facing use). A convertible car seat is not as easy to get in and out of the car as an infant seat, but it is cost effective because parents can use it from birth until the child weighs approximately 40 pounds. Forward-facing car seats should only be used when the child is at least 1 year old and weighs at least 20 pounds. When a child reaches 40 pounds, he or she can begin using a belt-positioning booster car seat. Make sure the car seat will fit your child, work in your car, and that you will use it correctly every time. Before you go shopping for a car seat, become familiar with your vehicle’s manufacturer instructions. If possible, bring your child to the store so you can “try on” different car seats. Buckle and unbuckle the harness several times, then tighten and loosen it repeatedly. Is it easy enough for you to do that you’ll do it properly every time? Check out the National Highway Traffic Safety Administration’s (NHTSA) ease-of-use ratings for more than 100 car seats at. Manufacturer instructions differ from car to car and seat to seat, so getting it right can be a headache for parents. According to the NHTSA, seven out of 10 children are improperly restrained in their car seats. The best way to make sure your car seat is installed properly and being used correctly is to attend a car-seat check, held throughout the year for free at locations throughout the Puget Sound region. “There is no Jiffy Lube of car-seat checks,” says Kathy Kruger, executive director of the Kirkland-based Safety Restraint Coalition, which conducts Washington’s Child Passenger Safety Program. At each check, a certified child passenger safety technician will thoroughly inspect your car and car seat, and help you make changes where needed. Make sure the car seat is secured tightly and doesn’t move more than 1 inch from side to side or forward and backward when you push on it firmly with an open palm. Make sure the car seat harnesses are snug. If you can pinch a fold in the car seat strap, it’s too loose. This is particularly important in the winter, when big coats can often give a false sense of how tight a harness is. To ensure a proper fit, take bulky clothing off your child before putting her in a car seat. Then cover her up with a blanket. “Probably the most dangerous thing for a child is parents taking their eyes off the [road],” says Ellen Passloff, a pediatrician in Seattle. Devote your attention to driving, even if that means letting your baby fuss for a few minutes. In addition, make sure other people who might transport your baby are safe drivers who know how to properly install and use his or her car seat. And those instructions that come with the car seat can often be lost in translation. To avoid any mistakes, have a child passenger safety expert conduct a full inspection to confirm the car seat is correctly installed and your child is properly secured. Carter Subaru has a Washington State Certified Safety Seat Installer at each of its locations. Julia Ditto is a Seattle-based freelance writer. At a recent car seat check, she learned that none of her child car seats were being used correctly.